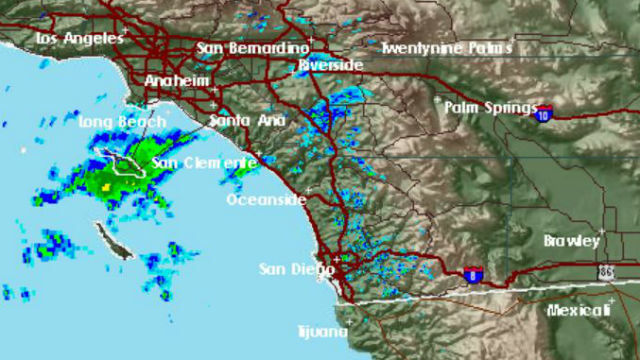 National Weather Service radar shows storms over Santa Catalina Island just before 10 a.m. on Thursday. A lingering low-pressure system could drop more light rain in San Diego County before leaving the region Thursday night, according to the National Weather Service. The storm could drop up to one-tenth of an inch of rain in coastal and inland-valley areas Thursday, while up to a quarter-inch is expected in the mountains and less than one-tenth of an inch is expected in the deserts. Snow levels will remain around 5,000 feet. In a 24-hour period ending around 3 a.m., Ramona got the most precipitation, with 0.58 of an inch, followed by 0.45 near Miramar Lake; 0.4 in the Palomar area; 0.39 in Escondido; 0.38 in Descanso; 0.37 in Skyline Ranch and Pine Hills and 0.32 in Pine Valley, according to the weather service. Meanwhile, the weather service issued a high surf advisory that will last until 1 p.m. Friday. Waves ranging from 5 to 8 feet are expected, and strong rip currents could create dangerous swimming conditions. Dry weather is expected Friday before another low-pressure system brings a slight chance of showers on Saturday, forecasters said.